A memorable shot for the album! ButterflyCircle members with PM Lee Hsien Loong at Butterfly Hill, Pulau Ubin. 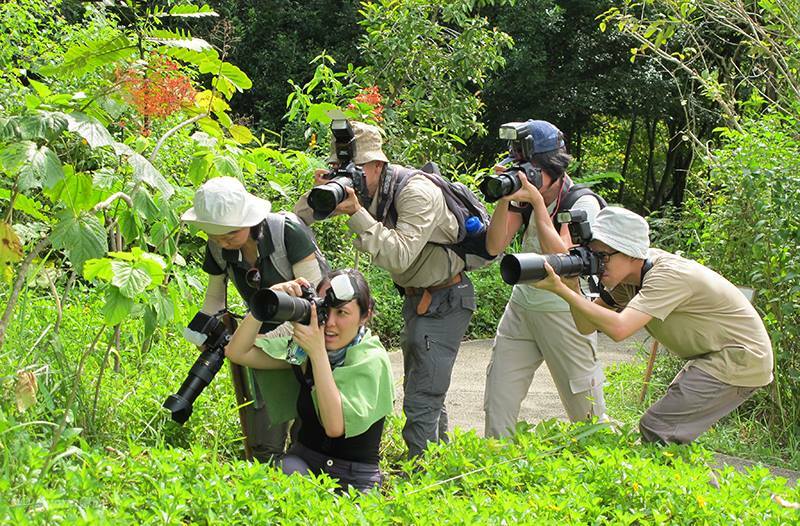 Note the Plain Tiger that photobombed our group shot just above our heads. 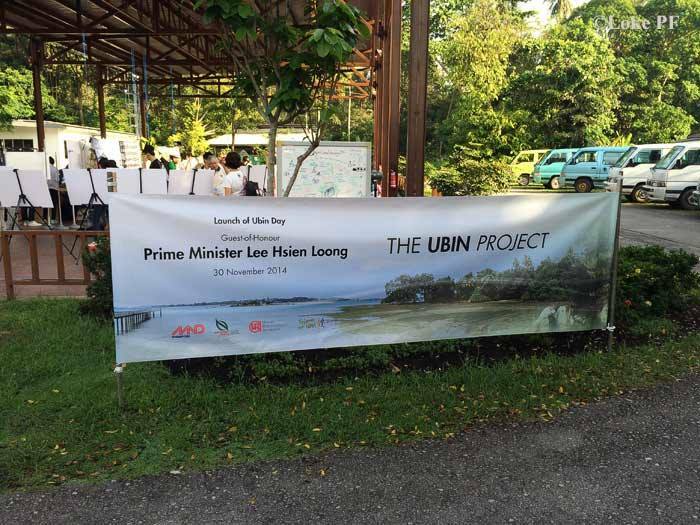 The 3rd instalment of Ubin Day returned on 30 Nov 2014, after more than a decade's hiatus. 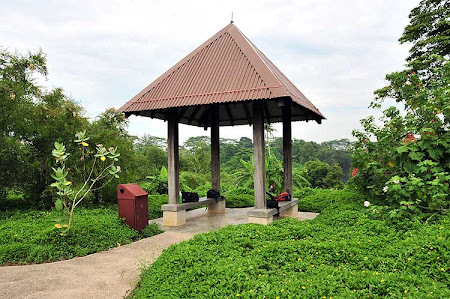 The idea for a special day to celebrate Pulau Ubin was initiated by Grant Pereira and there were two "Ubin Days" held in 2002 and 2003, and none since then. 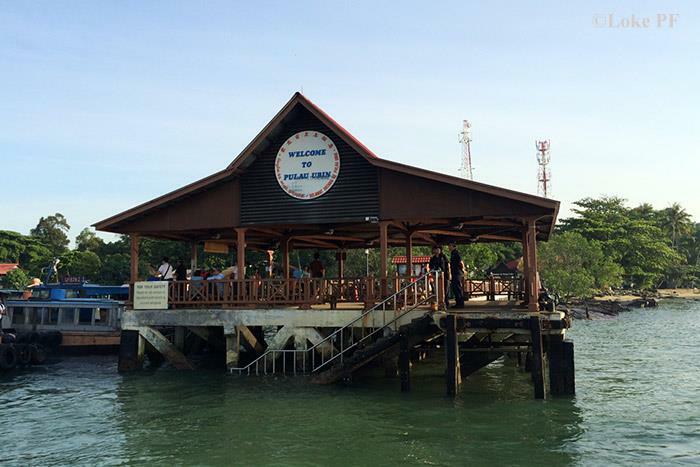 Back then, Ubin Day was celebrated to create awareness and appreciation of this "Granite Stone Island" as its name suggest in Bahasa Melayu. 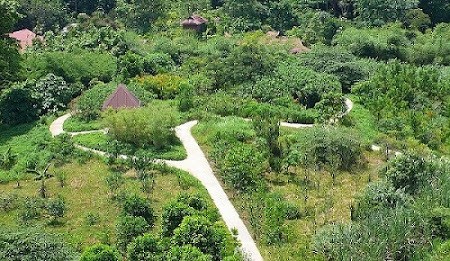 The 7km by 2km island is often considered the "last frontier" of Singapore's rustic environment and hot bed of rich biodiversity. Spared from intensive development for the past few decades, whilst Singapore grew from third world to first, with its rapid physical development, time almost stood still for Pulau Ubin, after the early granite quarries stopped operations. Today, the island is a favourite weekend destination for many Singaporeans and residents who visit the island to get away from the urban lifestyle and hectic rush of our daily work life. Offering a wide spectrum of mainly outdoor activities from cycling and bird watching, to camping and canoeing, Pulau Ubin continues to attract nature lovers and the outdoor types on weekends and public holidays. In early 2014, the Ministry of National Development, led by Minister of State Desmond Lee, visited Pulau Ubin with a group of nature enthusiasts, heritage experts, community leaders and public sector agencies. 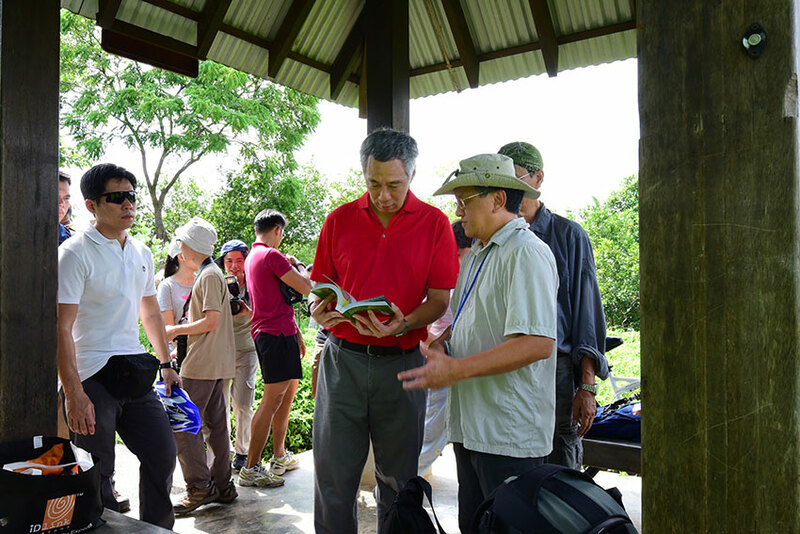 The visit was part of the wider plan to initiate a conversation with Singaporeans on how everyone can play a part to suggest ideas to sensitively enhance the natural environment of Pulau Ubin, which was announced by Mr Desmond Lee in Parliament in March 2014. Subsequently, the Friends of Ubin Network (FUN) was set up to continue to engage the stakeholders whilst a public feedback portal and Ubin microsite to discuss possible options for Ubin. 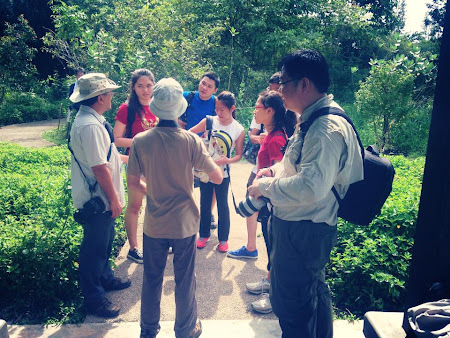 There have been numerous media articles and blog articles discussing what different groups of people want for Ubin. This year, Ubin Day was spearheaded by Ria Tan, Sumita Thiagarajan, working with NParks, which capably hosted the event. 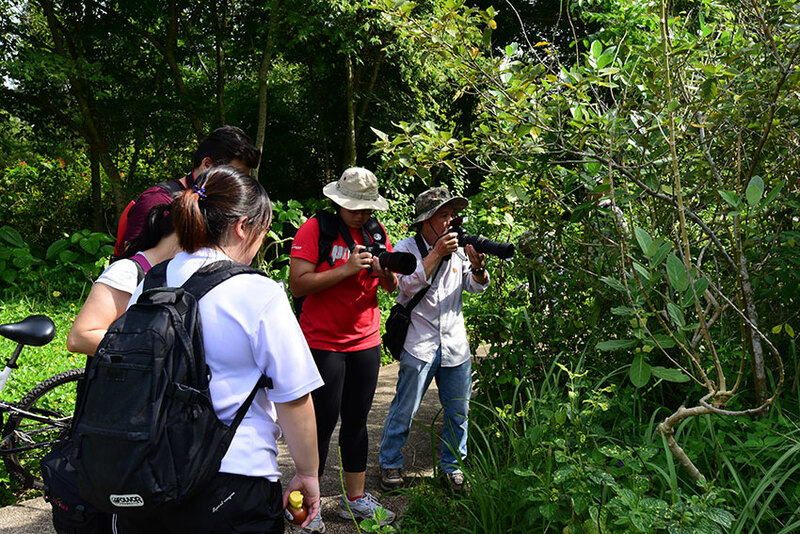 Ubin Day 2014 was supported by 31 different organising groups featuring a wide range of activities, throughout the day (and night!). 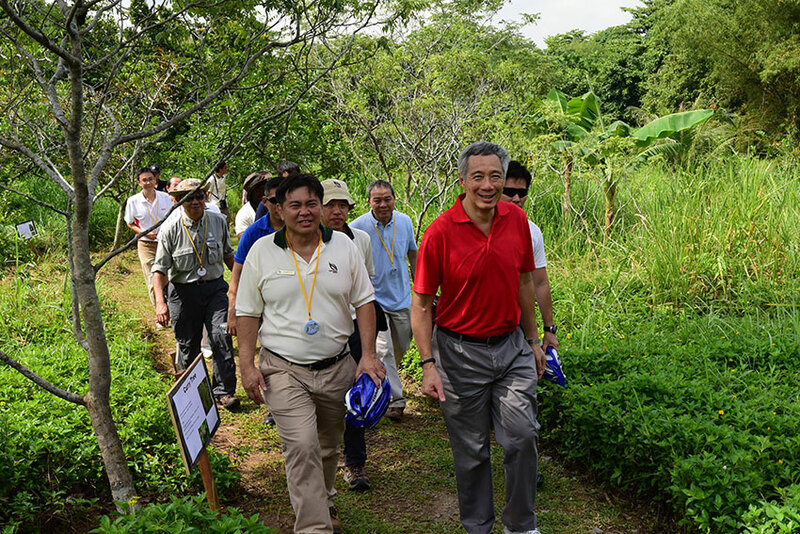 The guest of honour for Ubin Day was none other than the Prime Minister of Singapore, Mr Lee Hsien Loong. 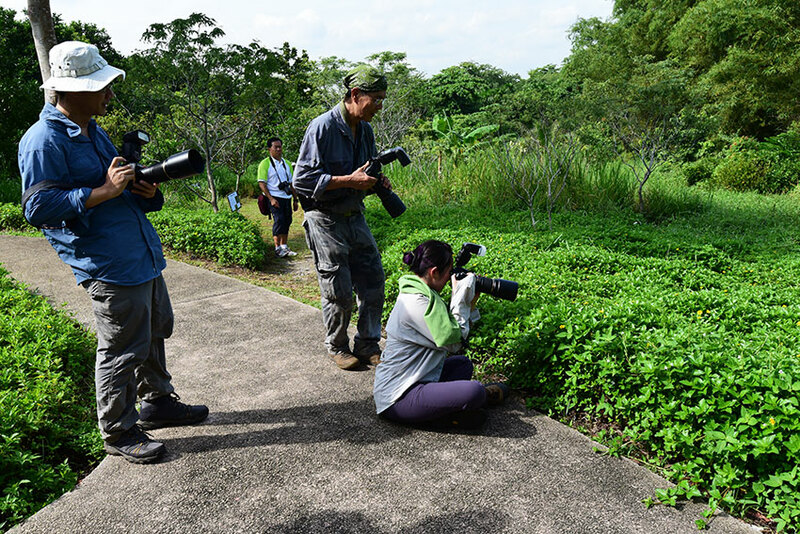 ButterflyCircle members organised a butterfly watching and photography session at Butterfly Hill. 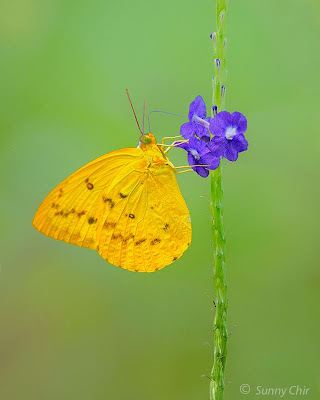 This little knoll, which I wrote about recently, is an excellent place to watch butterflies and good for photographers who are starting out and learning how to shoot butterflies in their natural environment. 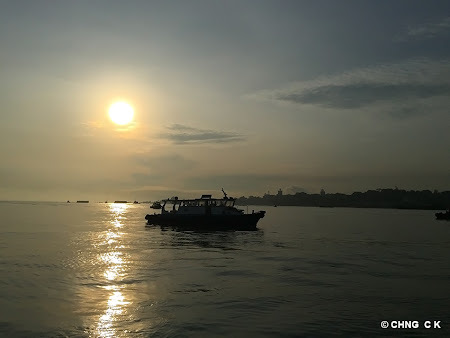 Our day started earlier than usual, and our members gathered at the Changi Ferry Terminal at 7:30am. 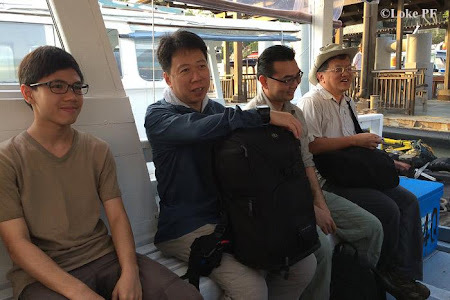 We quickly boarded one of the bumboats and headed out towards Ubin. Looking back towards the east, the morning sun and clear skies promised a hot sunny day ahead! 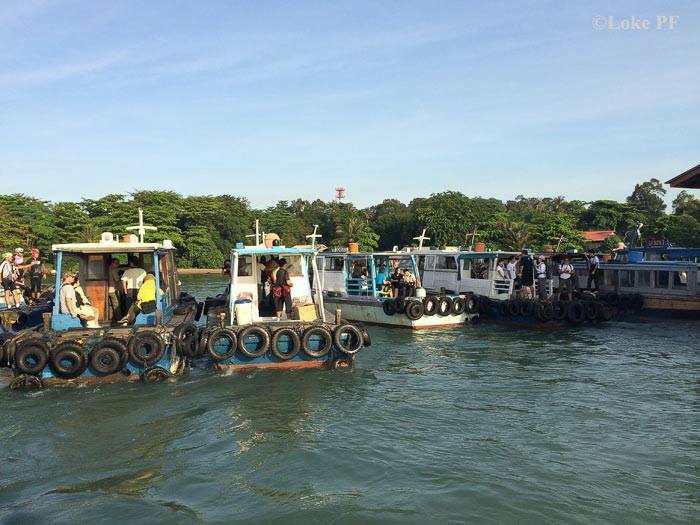 At the Ubin jetty side, a slight mismatch in schedules caused a "traffic jam" as security personnel who were inspecting the jetty had not completed their work, and caused a bunch-up of all the bumboats waiting to berth at the jetty. 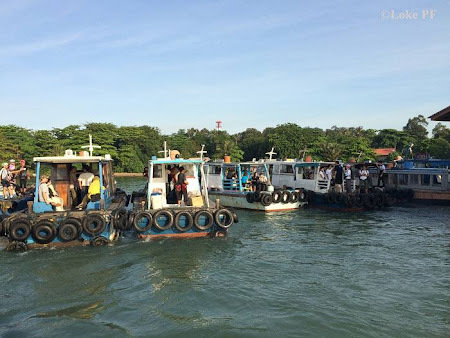 It was quite interesting to see, for the first time, at least 20 boats bobbing up and down just a few metres shy of the jetty, with their passengers waiting impatiently to disembark and get on with the day's activities. Finally, we got the all-clear signal and all the groups headed to their pre-determined stations to start their activities. I was at the town square, where several groups had set up booths displaying posters and other paraphernalia showcasing their groups' activities. ButterflyCircle members headed towards Butterfly Hill to wait for the registered participants for our activity. 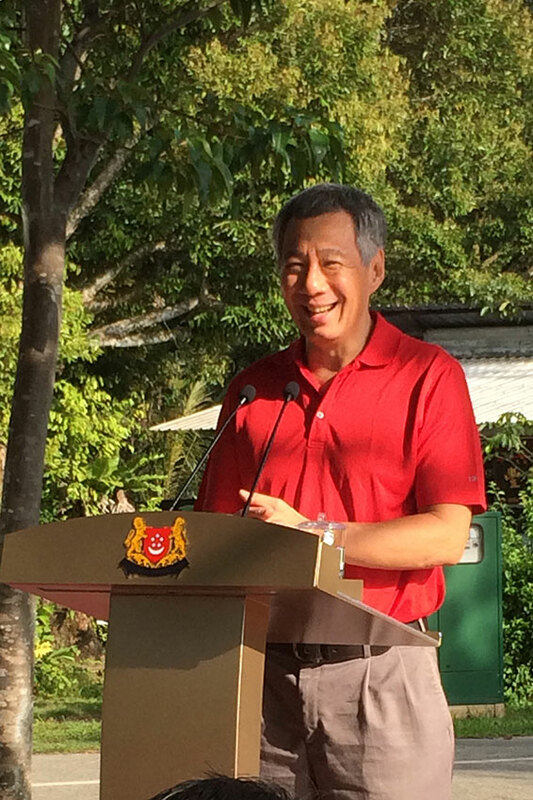 Before long, the guest of honour, PM Lee had arrived at Ubin and headed for the town square. 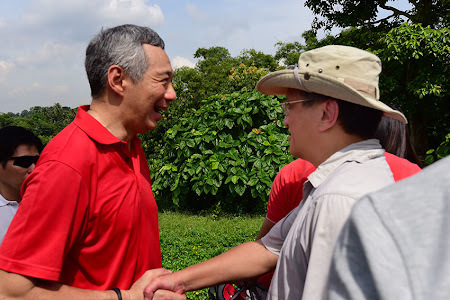 He gave a speech about the government's intention to contain Ubin's development to what is needed, and also sensitively develop any new facilities with biodiversity conservation in mind. He toured the booths and chatted with the volunteers. After that, he set off on a tour of the island and some of the key areas. I made my way up to Butterfly Hill, where our members were already at work, spotting butterflies for the participants and sharing a tip or two about butterfly photography. 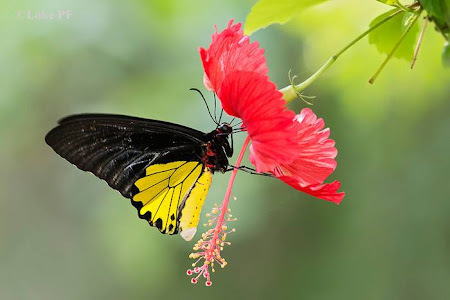 It was encouraging to see the participants working hard, chasing the butterflies that were out and about on this sunny morning. 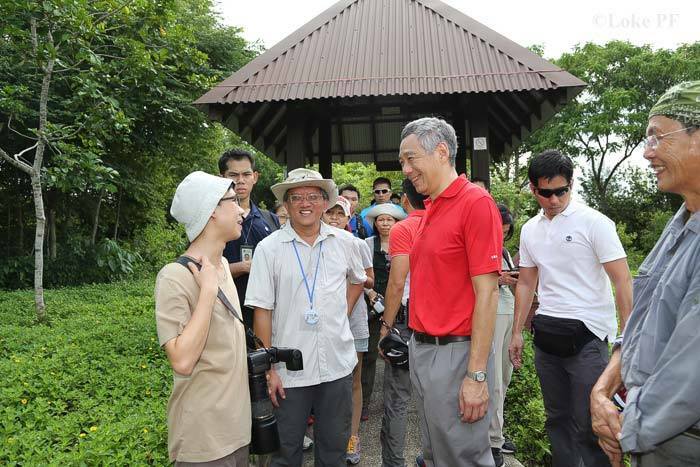 At around 11am in the morning, PM Lee and his entourage reached Butterfly Hill and we showed him around the hill, highlighting the butterfly-friendly landscaping and myriad of butterflies fluttering around. PM Lee stopped and took a few photo mementoes of his own. 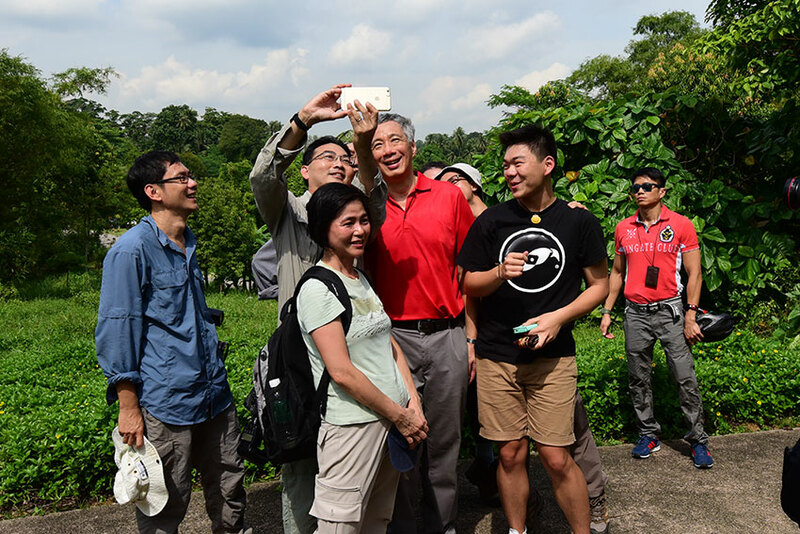 He sportingly entertained "selfies" from amongst our members, before taking a group shot with ButterflyCircle members at Butterfly Hill. 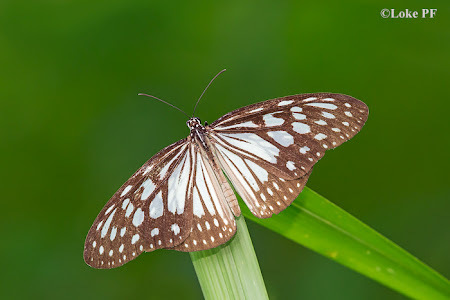 Two additions to Butterfly Hill checklist and also the Singapore Checklist! The day ended just past noon, where we had a sumptuous lunch at the "two sisters'" kopitiam. It was a satisfying day for our members. 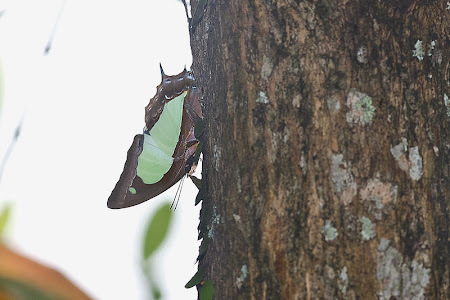 Our junior member, Jonathan Soong, even managed to record a re-discovery for Singapore on Ubin Day itself - the Malayan Nawab (Polyura moori moori) at Butterfly Hill. This was added, together with an earlier discovery on 5 Oct 2014 of the Grey Glassy Tiger (Ideopsis juventa sitah) by ButterflyCircle member Loke PF, also at Butterfly Hill! 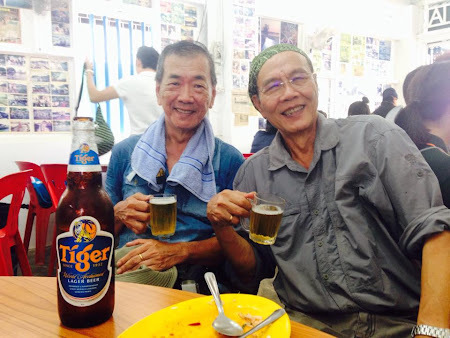 ButterflyCircle's Pioneer Generation members - Bob Cheong and Sunny Chir - Give them a TIGER! 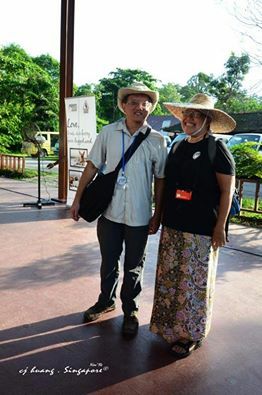 Tired but happy. 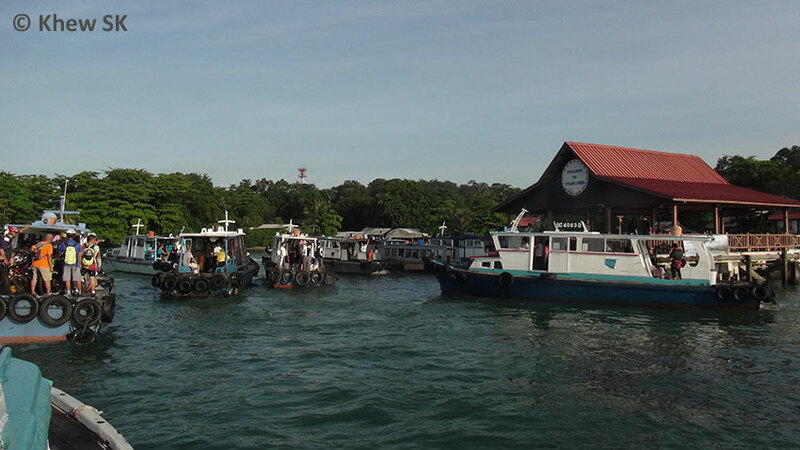 On the boat ride back to Changi Jetty and home! It was a memorable day for all, as we headed back to Changi Ferry Terminal. Thanks to Ria for inviting ButterflyCircle to join in the fun on Ubin Day, and our friends in NParks for capably providing the logistics support for the whole day. We look forward to a nature and biodiversity-friendly Pulau Ubin for many years to come! 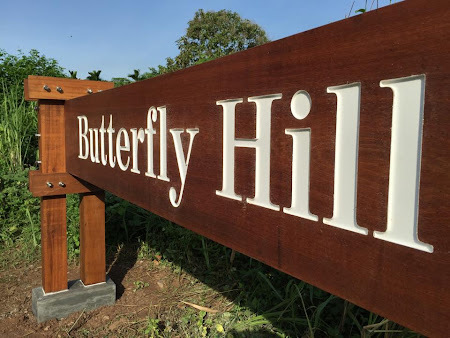 Special thanks to ButterflyCircle members who turned up to volunteer their time at Butterfly Hill on Ubin Day : Sunny Chir, Chng Chuen Kiong, Huang Caijin, Koh Cher Hern, Loke Peng Fai, Tan Keyang, Lemon Tea and Jonathan Soong. 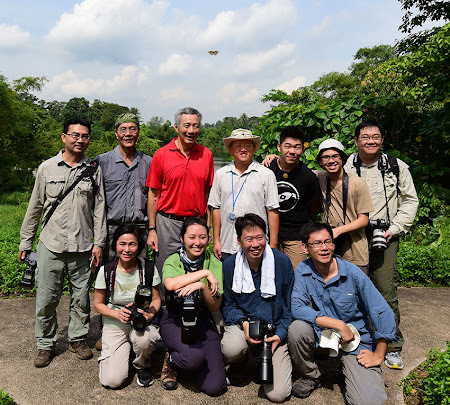 Thanks also to our NParks friends, CEO Kenneth Er, "Mayor of Ubin" Robert Teo, Choi Yook Sau and many many other Nparks staff who supported ButterflyCircle and made our day special.